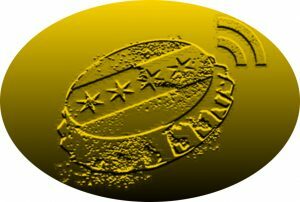 Craig is back again with his GABF ABV Awards for 2016. While still stacked with Mountain and Pacific breweries, there was enough at the festival to get a taste of what the USA was doing in brewing. 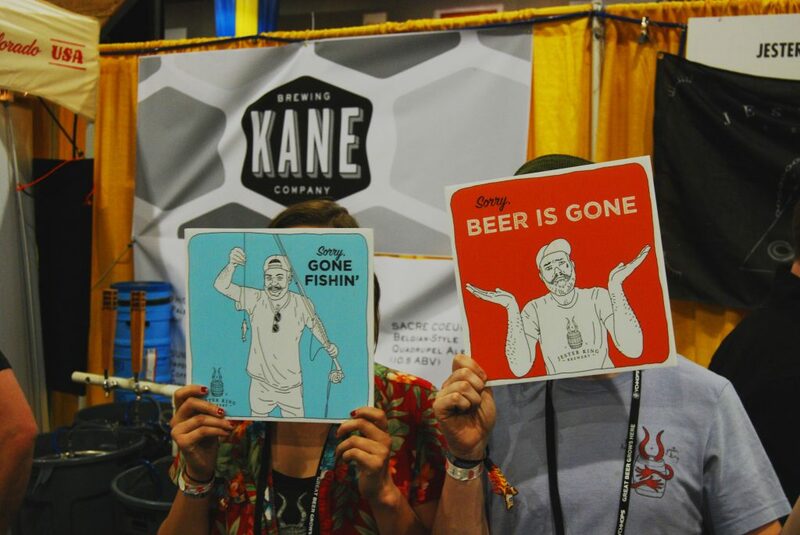 These beers and events were the best of the best. 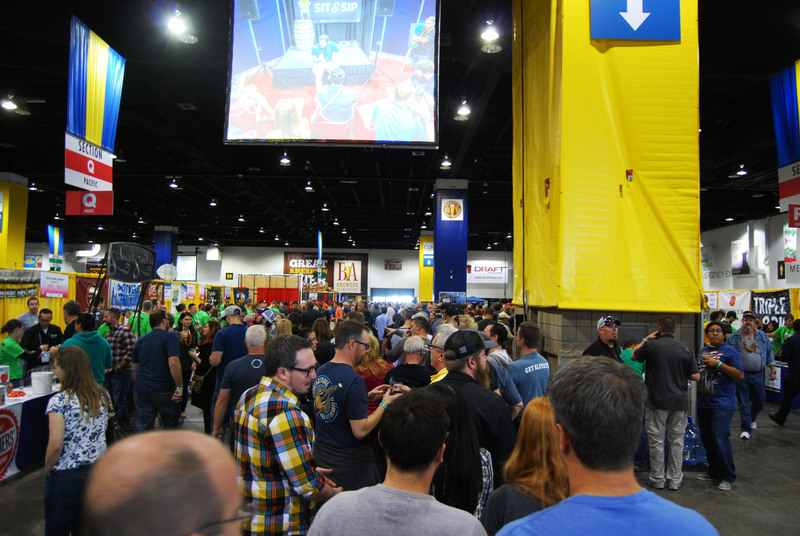 Be sure to check out our GABF wrap-up episode, featuring interviews with some of the breweries mentioned below. 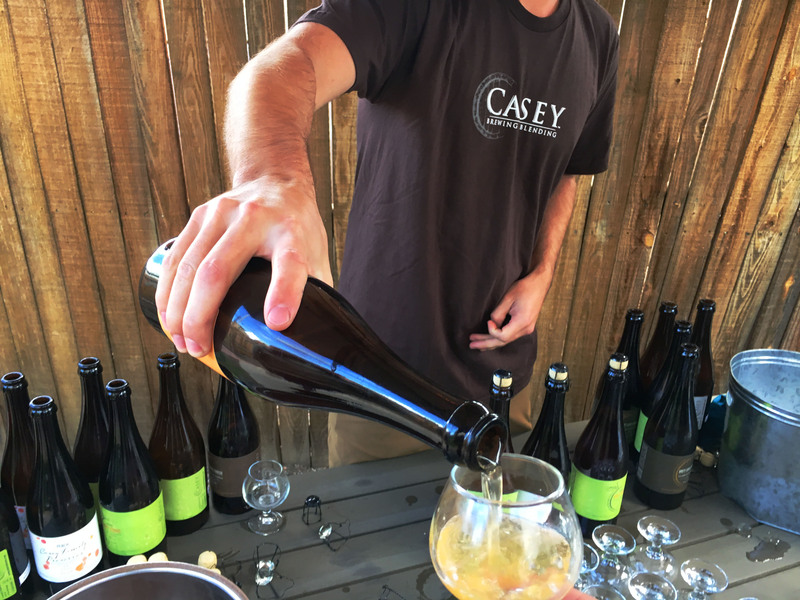 Getting a pour of Casey’s The Cut: Peach. 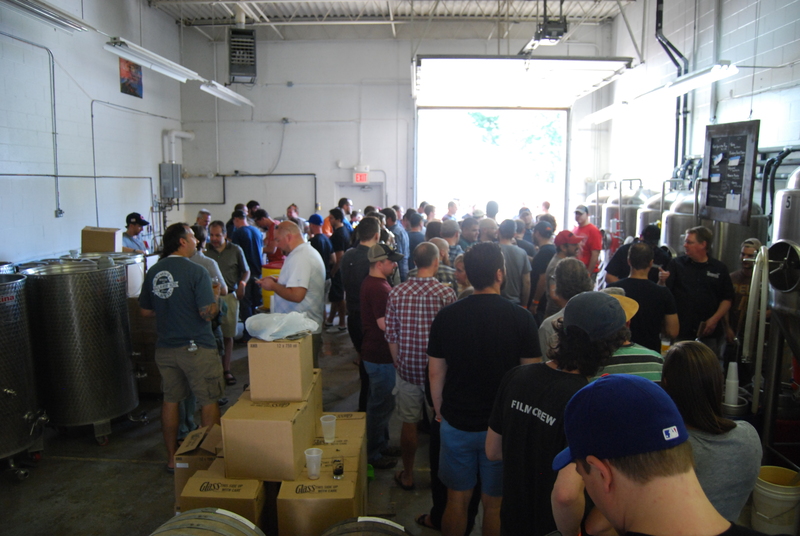 Once again, Small Batch got a heavy drop of Casey Brewing and Blending beers, but this year they decided to add a tasting aspect to the proceedings. Being able to buy Casey bottles and then sample them at the same time is awesome, but having it be so chill was just a bonus. 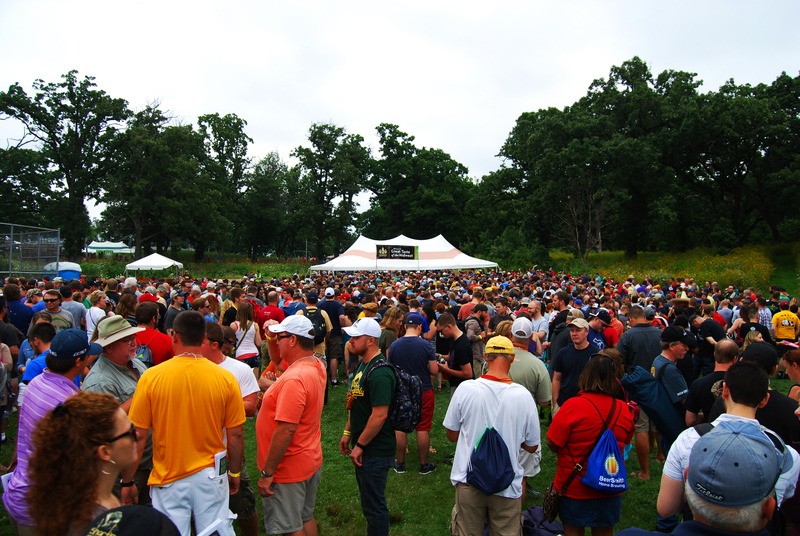 While the line to purchase bottles was long but not insane, the tasting had one-third of the people at it, allowing you to stake a spot in the backyard area and sip on your sample with ample breathing room. The bottle sale line move fast, efficiently, and through the store, allowing visitors (like me) to scope out what was being offered in the Denver area on shelves (Crooked Stave, Odd13, Melvin, and River North were the standouts). I would go back just for the tasting. Beginning of the end: Russian River’s Consecration flanked by 2X4s. IPAs from Melvin, Lawson’s Finest Liquids, Boneyard, Creature Comforts, 3 Floyds and more? I couldn’t deplane fast enough. It was absolutely slammed in Falling Rock when we (MC Johnsen and I) arrived at the event about an hour late at 10:30 PM. A slight disappointment washed over me as I didn’t see 2X4 from Melvin or any Lawson’s IPA, but I quickly shook that off and had my choice of the 3-Way IPA (from Fort George, Barley Brown’s, and Melvin), Notorious (from Boneyard), and Tropicalia (from Creature Comforts). While we were patiently waiting in the mob of a line, Chris Black approached the tap list board and hung up what I thought had already kicked – Lawson’s Double Sip of Sunshine (later confirmed by Sean Lawson to be Double Sunshine). So we got a 3-Way IPA and a Double Sunshine and moved over to talk to the Melvin crew, ostensibly to ask them where 2X4 was. Jeremy Tofte was more than happy to let us know that it was on tap at Falling Rock 24/7, so we mosied on in to get it. While waiting in that mob, we spotted Russian River’s Consecration on tap (for $8 a pour no less), so we got 2 2X4s and a Consecration. All the while the mob of people out front and inside had been decreasing, leading to space for some impromptu dancing to the beats being played. By the time we left, it had basically cleared out and I was looking for some food to stop the drunkenness from having 3 full pours of 10.5% 2X4. The insane tap list (and cheesy garlic bites!) were back. Hops and Pie did the same thing last year, albeit with just Casey Brewing and Blending. This year they added Cascade and we were a year wiser – we got there a little bit before the 11 AM start time. Facing a long line, we decided to wait it out to see if we got in on the first rush. We barely did, and we once again thoroughly enjoyed it. Yes, it took a while for our first round of beers to come out due to everybody ordering the same thing at the beginning, but we were kept content by their amazing garlic cheesy bites appetizers. Ryan once again went with some world class hoppy beers from their yet again insane taplist, choosing for some Comrade, Russian River and Wicked Weed along with a Casey and Cascade pour. 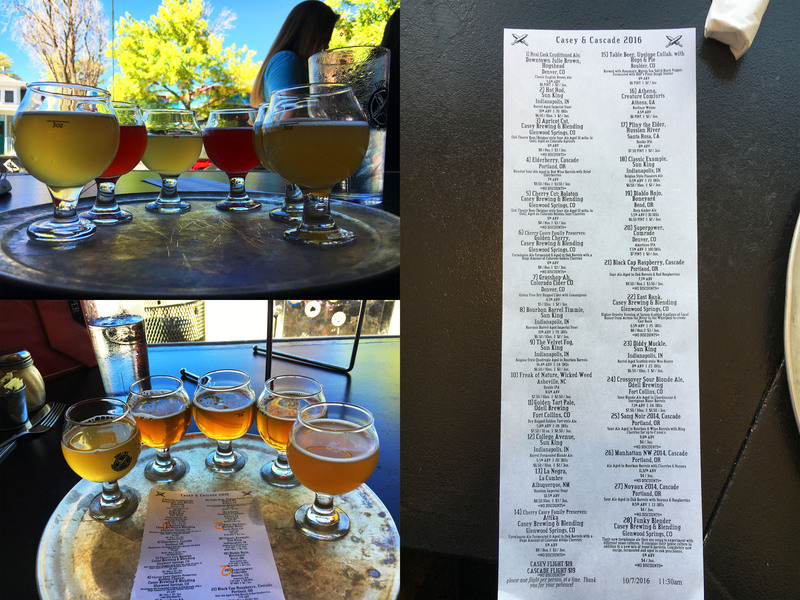 I stuck to the Casey flight, featuring Apricot and Cherry Cuts, Cherry and Golden Cherry Family Preserves, their delicious East Bank, and a saison called Funky Blender. My preferences ran towards the Balaton Cherry Cut and Cherry Family Preserves as they featured the best balance of acidity and tartness. 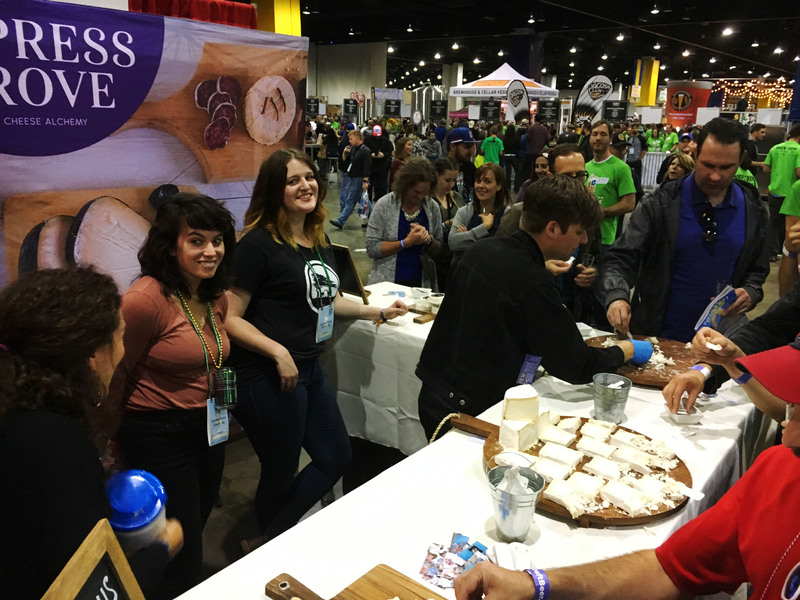 Again, this was must stop event during GABF, with amazing beer and food. Beautiful venue for some beer and food pairings. This event, located in the back of the hall in a glass encased patio, paired 21 different breweries with 21 different chefs. The catch was that most of these brewery/chef pairings were across the continent from each other, like a Seattle brewery paired with a Washington, D.C. chef, forcing each to be a little more creative in their pairings. But was this event worth $170 for a ticket? If you are a food connoisseur, don’t even think about it; it’s a steal. If you’re more interested in the beer, it’s still a yes, but with a small caveat. The Paired event runs concurrent with the GABF main event, causing me to split my time between the Paired event and the main event. I would have really liked it if the Paired event was, say, 1-5, with the main fest starting shortly thereafter. 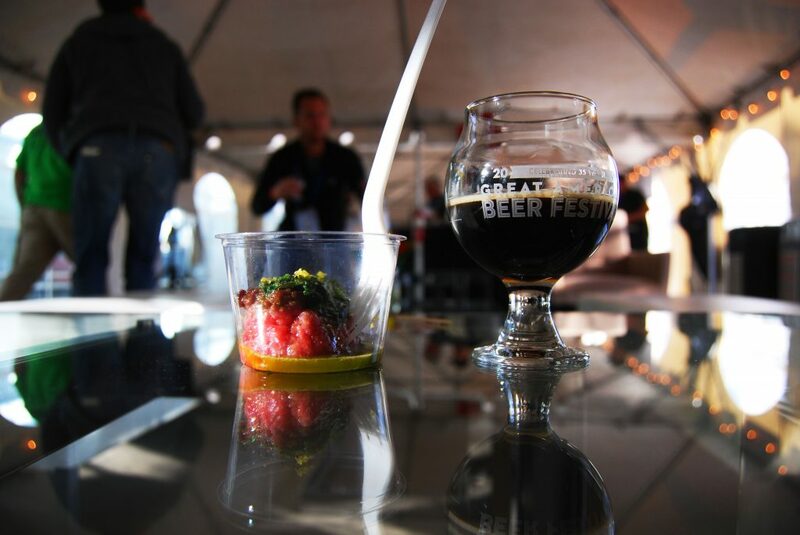 I could have (and would have) spent all day sampling the delicious food and beer pairings in a sun encased room. The venue for Paired was as beautiful as was the food being served, with high glass walls and ceilings and an outdoor patio for you to just stand there and soak it all in. 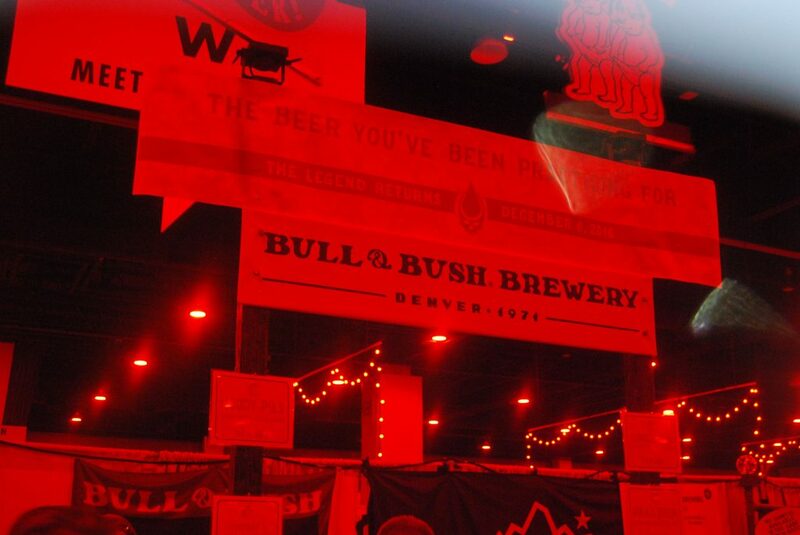 A beautiful event showing people what is possible with beer and food and well worth the money. I would really have liked to get some cheese from this booth, but the line – from opening to when they closed – was both extremely long and, more importantly, extremely slow moving. I attempted to get in line (when it ended near the end of their winding boundary), moved about 5 feet in 10 minutes, and decided I was missing too much of the fest standing there. It was like this last year as well, so maybe more ACS booths spread around the convention so it’s not all concentrated in one? I don’t know, but it made the Cypress Grove booth all the more impressive and necessary. This one is squarely on the floor planners. Take a booth that had lines extending the length of the floor last year (Funky Buddha), mix in a well-regarded brewery that hasn’t been to the fest in 3 years (Jester King), put a former gold medal-winning brewery with awesome beers next to them (Kane), and then, right in the middle of this, put the bookstore, which features signing from luminaries like Randy Mosher, Charlie Papazian, Ray Daniels, and the like. At the beginning of the fest, avoid this area. It somewhat eased up, if only because Jester King ran out of beer so fast (their line would hit the bookstore and arc towards the main event area), but then people would be waiting for Kane, which kind of ran into both the entrance line of the bookstore and the Funky Buddha line. The bookstore should’ve been off to the side or in the front of the fest, but not in the middle of the Meet the Brewers area, especially if they’re planning on having signings and such. See the red drape in the middle-left background? That’s the Russian River booth. Ugh. This section was mostly bad all around. Russian River had a line that ran the entire length of the section. Rare Barrel had the same. Bottle Logic and The Bruery had timed tapping pretty much every session (see below). Lost Abbey had Cable Car, so they had an enormous line until it ran out. Ballast Point – yes, $1 billion, distributed pretty much everywhere Ballast Point – had a line. That section was so bad that I realize, near the end of the Friday session, that I hadn’t had much from Pacific breweries, and I think avoiding the insane lines everywhere in the section was the reason why. There were some great breweries in the section (see: Highland Park), but it shouldn’t be a chore to get there. One day someone will read this and finally stop this practice. Some people will say, “Well that’s only because it was for a beer you wanted.” While that was true in ONE instance (Bottle Logic’s Fundamental Observation), I saw at least five other timed tappings, one of which we didn’t know about and ran right into. So why are they so bad? First of all, it’s usually something highly desired. Timed tappings I witnessed were for Fundamental Observation and Stranger Than Fiction from Bottle Logic (both BA stouts), Chocolate Rain from The Bruery, Parabajava (coffee Parabola) from Firestone Walker and Utopias ($200 a bottle retail) from Sam Adams. So what do beer people do for a 7 PM announced time tapping of a highly desired stout? Well, they start a line. At 6:30. That of course grows, causing a foot traffic jam in the area of the tapping. It was evident at the Bottle Logic booth (7 PM tapping) and Bruery booth (7:30 PM tapping) when there was absolutely no way to walk down that aisle thanks to the insane lines forming, thereby causing undue congestion. Which tapping did we unknowingly run into then? The Sam Adams Utopias one, of course. 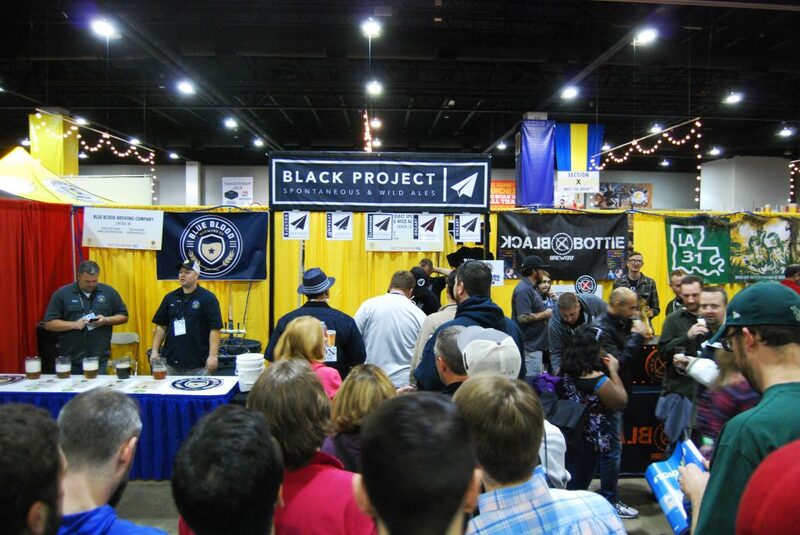 Trying to get from the Jester King/Kane booths to the Black Project booth, we all of a sudden were stopped dead in our tracks; people were just standing around, waiting for Utopias to be tapped by Jim Koch. 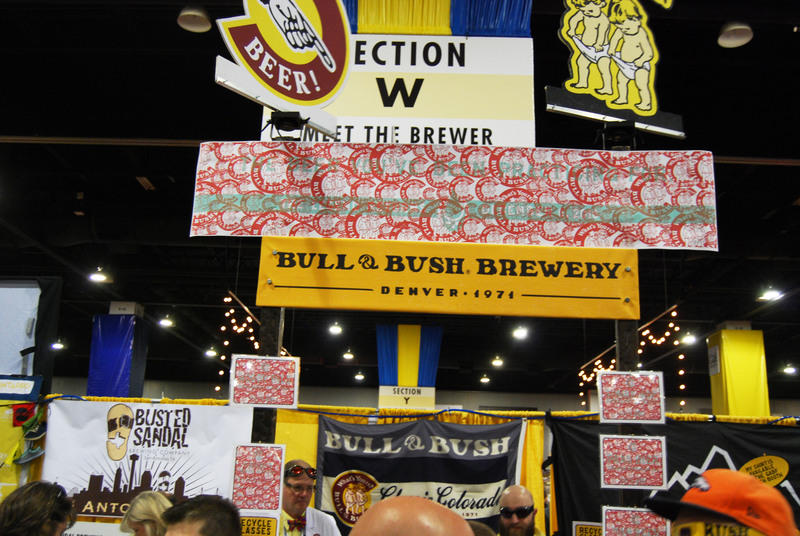 It took us a good 5-10 minutes to navigate and get through a 100 foot section of the fest, which is horrible.Please, GABF, get rid of timed tappings.You were able to ban stickers because they were being put on poles, so get rid of this as well. It really gums up the flow of an otherwise great festival. Did not have any Doritos or Cheetos. Fail. I guess the rules stated that as long as you’re wearing it, you can bring it in, so I ran into multiple people with bags of snacks attached to them. Someone even suggested wearing the things to make drinks like Bloody Marys. The future is now, and it’s Snack Chic. 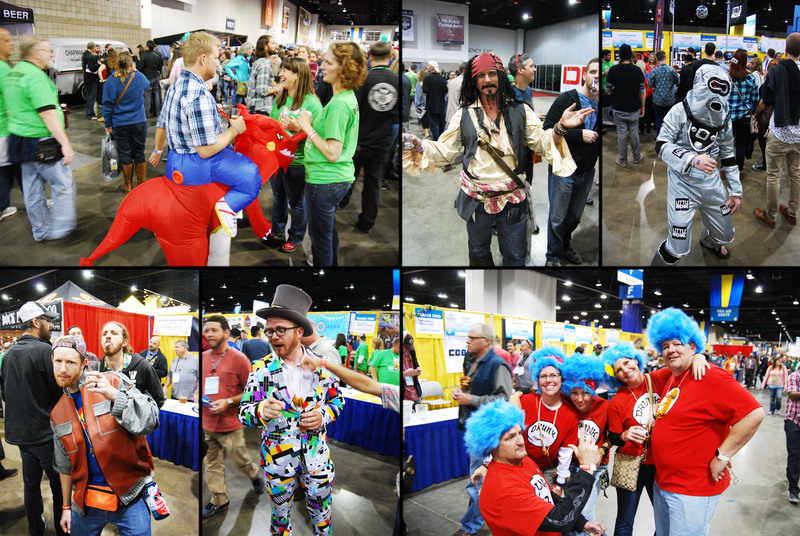 I saw all manner of costumes, including like 9 Waldos, but not too many beer-related ones. It’s slowly but surely turning into comic-con. I was told the theme would change each session (Friday session appeared to be inspired by Jem and the Holograms), but the Thursday session theme was awesome, featuring handmade capes with the FATE emblem stitched in either gold or silver and accompanying masks (think Eyes Wide Shut-style costumes, with less nose). I repeatedly asked for a cape and never got one. 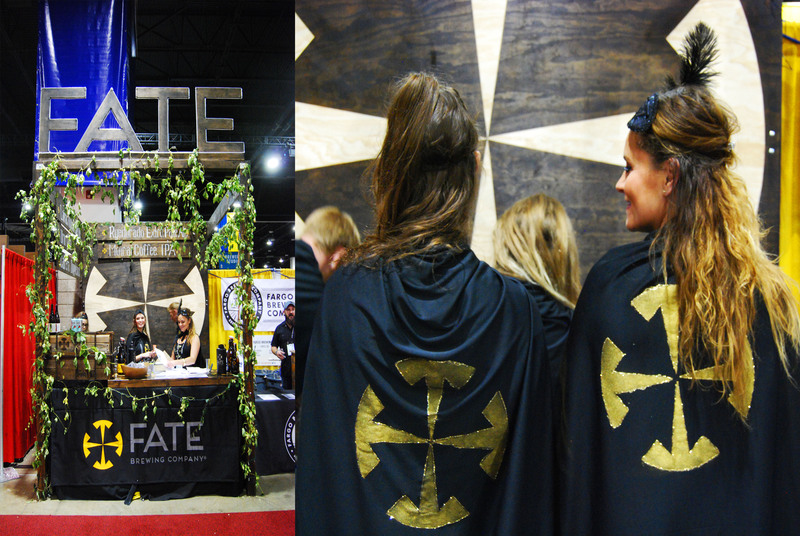 More places need to employ capes, as they’re perfect for gliding through a beer festival! Remember those photo mosaics, where you take individual photos, arrange them in some order and, when viewed far away, make another picture? Sure you do, and so does Odd13. Already heavily influenced by beautiful comic book-style art on their cans, Odd13 decided to make a can mosaic, featuring a muscular individual hold up a barrel with a 13 on it. Unbeknownst to me, they also had one spell out “Odd 13” in front of the booth that I, of course, bumped into. Thankfully it was glued together. 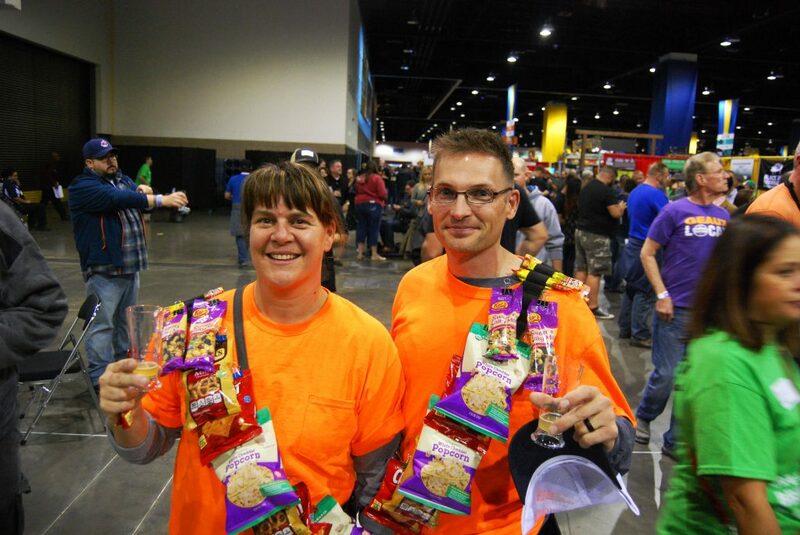 It was an wholly unique booth display, one that earned them the “Festival Flair” award. Only problem was the beer names weren’t there, so I eventually resorted to asking for the beer by the color of the can (orange, blue and green were my favorites!). We saw their employees walking around in lab coats and goggles and wondered where the booth was. When we found it, there was a mess of a line. People getting stickers on their clothing, glasses being handed out, and a cardboard cut-out where you could take your picture at. At first a delightfully fun area, it all became apparent what was going on when you put on the red-colored, X-Men Cyclops-style glasses. A Night to End All Dawns was back to being itself, though not at the cocoa-powder heights of 2014. Sunday Brunch – an imperial porter with coffee, maple syrup and cinnamon – was breakfast in a glass. Their Head High IPA was hoppy and drinkable, Object Permanence (BA American Barleywine) stayed sweet with some toffee undertones, and Sacre Coeur (Quad) had the bready and spicy notes you’d expect in a Belgian Quad. A Ryan find, all the beers at Highland Park’s booth were solid. From their crisp and clean Fill Pils to their Amarillo, Simcoe, and Citra hopped Good Green (excuse me, GABF gold medal winning Good Green), everything Highland Park had was tasty and enjoyable. The clear standout, however, was Fun Juice, a barrel-aged sour red ale with lacto, pedio, brett, grapefruit zest, passionfruit, and orange. Everything was in balance and it was fruity yet tart. At 4%, it’s a beer you can drink again and again on the beach. IPAs, sours, and fruited beers in cans? Yes please. From their two IPAs (Codename: Superfan and Noob) to their session sour (Vincent Van Couch), I went through their entire line-up more than a few times. Standouts, for me, were the Noob (their take on an New England style IPA) and Van Couch, their delightfully tart Berliner Weisse. Neil Fischer, owner and head brewer of Weldwerks. Weldwerks had a lovely variety of offerings, including an apricot gose and their hefeweizen, but their standouts were double dry-hopped Juicy Bits, Puesta del Sol, and BA Mexican Achromatic. The Juicy Bits was a spot-on New England style IPA, very hazy with a bouquet of fruit notes; Puesta del Sol is a lovely Vienna Lager, filling due to the maltiness but not overly so and very refreshing; and BA Mexican Achromatic, while not a BA Abraxas killer, was well balanced, with vanilla and heat coming from the barrel, lovely subtle chocolate notes and not going overboard on the cinnamon. And it’s coming to FoBAB, so be on the lookout! Unfortunately, this is what most people saw when going to the Jester King booth. Breweries from outside of the Denver metropolitan area usually have some choices to make on what beers to bring. Go with your year round line-up, go with rarities or go with a mixture of both. Jester King absolutely brought it will all rarities, and they were rewarded with extremely long lines and very quick sell outs. Atrial Rubicite (barrel-aged sour with raspberries) and Montmorency vs. Balaton (barrel-aged sour with cherries) are widely desired in beer trading circles, so a quick run out was expected. For their third beer, however, Jester King went and brought a spontaneously fermented beer that hasn’t even been named yet; it was simply listed as “2016 Spon 1.” Anything you got at the Jester King booth was going to be a top-of-the-line, brewery-only, limited release, that necessitated you hitting their booth first. Their “Sorry, we’re out of beer” signs got a ton of use. Line all the time, per usual. 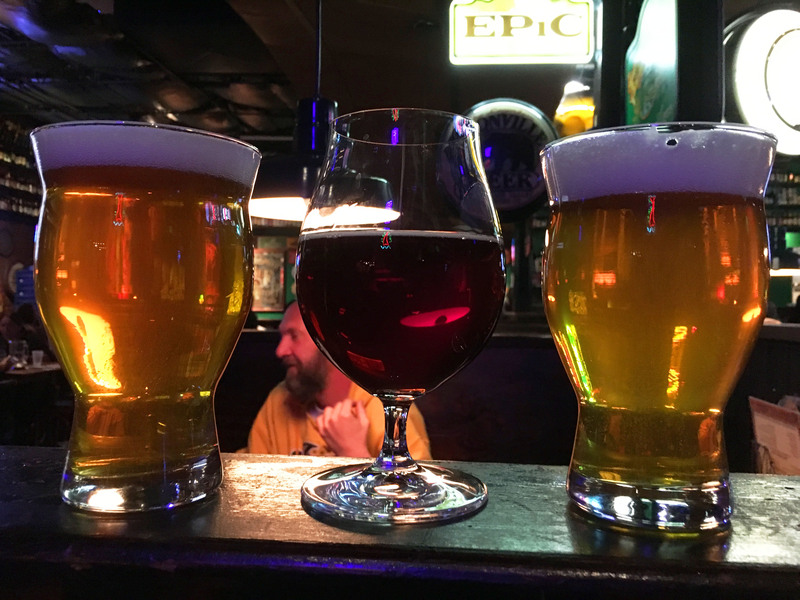 Last year, James Howat poured only 3 beers; he ran out relatively quickly. This year, he upped it to 5, so he ran out in a slightly longer time. In addition to his spontaneous gueuze/lambic-style Oxcart and Cherry Oxcart (more on those later), Howat brought along Jumpseat and Ejector, his dry-hopped and double dry-hopped wild ales, respectively, and Elsewhere, his 100% coolship caught microflora sour red ale. All offerings were tart and never ventured into acid-reflux-inducing sour, and the dry-hopped sours featured the best of the Citra, Mosaic, and Equinox (citrus and fruity notes) without tasting like a bitter IPA. Everything was balanced, soft, and very enjoyable. It really explains why there was a substantial line until he was out. They’re laughing because they just banned us from the booth. On Friday, we made one of the best decisions of the festival. We decided on a plan of action that would allow us to stop at the Cypress Grove booth every hour. Not only did it help keep us relatively sober, but we also were able to enjoy stupidly delicious cheese, all while waiting in a minimal line and (most likely) completely annoying the staff. 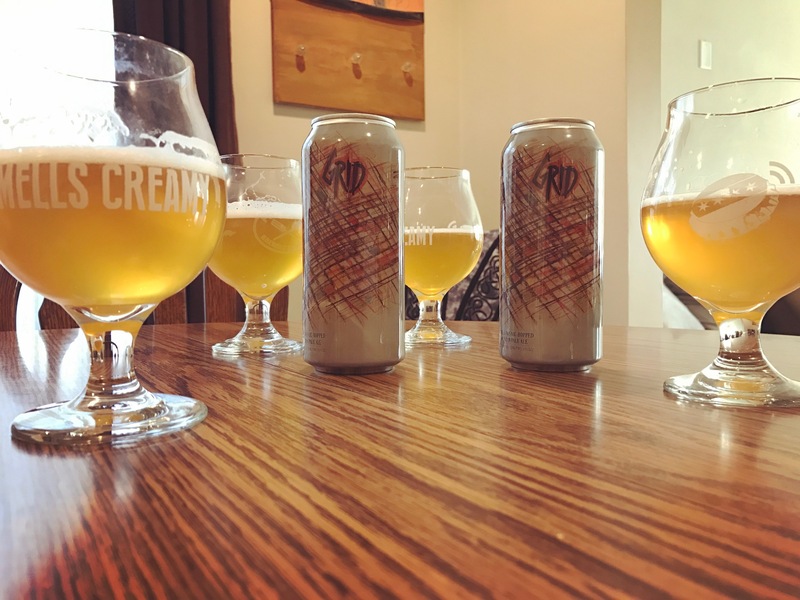 It became a minuet of mold, starting with the lavender and wild fennel infused Purple Haze, sliding over to the crumbly Humboldt Fog, a light and creamy delicacy with some acidity to the finish. It was then on to Truffle Tremor, featuring much the same consistency as the Humboldt Fog, but packed with Italian black summer truffles giving it that umami flavor kick. And, saving the best (in my opinion) for last, the Midnight Moon, the hardest cheese of the four. Aged for at least six months, Midnight Moon has a lovely buttery taste to it, supplemented by the crunchy protein crystal that come from aging (which I absolutely love in cheese), and finishing with a sharp cheddar bite that leaves me wanting more and more. 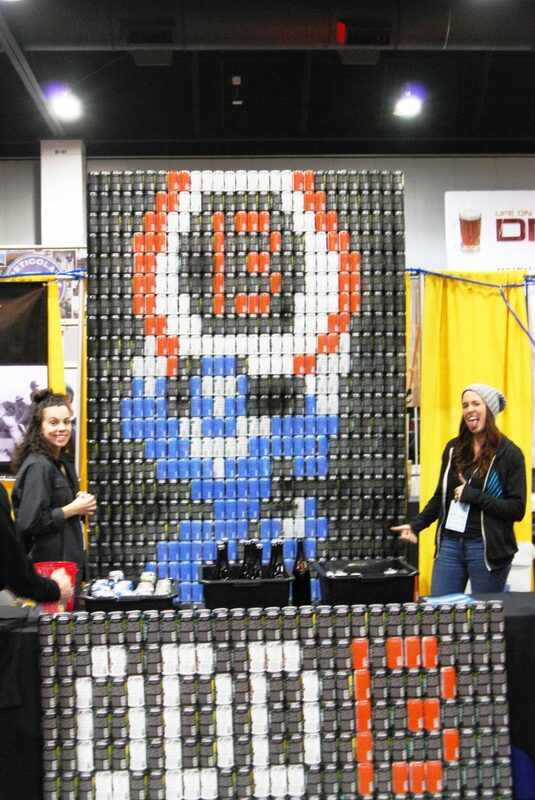 If given the opportunity, I would’ve ate their entire stock of it right there at the booth. Alas, I didn’t get to do that, but I did pitch a tent at the end with the toothpicks, content to repeatedly getting as many as four chunks on a pick. Forthwith, I shall be dreaming under a Midnight Moon. An 11.5% imperial stout that fills the room with chocolate? Yes please. It seems as if the medal winners of the chocolate beer category are never being poured on the festival floor (they weren’t last year), but thankfully RAM decided to pour this one. Cocoa powder, Nestle Quik, Cocoa Puffs – whatever chocolate food stuff you like or are familiar with, that’s what it tasted like. When someone standing 10 inches from your glass says, “You smell like chocolate,” you know it’s a winner. He did it again. Last year it was Miami Madness (which was there again this year), this year it was Haterade. As opposed to last year, he brought a variety of fruited Berliner Weisses this year, including DFPF (Dragonfruit Passionfruit) and, when that kicked, Street Fruit, but the clear standout was this 9 fruit Berliner. Upon first sniff, you are immediately taken back to when you were playing soccer or basketball in school, because it smells exactly like fruit punch Gatorade. Then you drink it, and it tastes like fruit punch Gatorade. It was hard to believe that Wakefield didn’t actually put fruit punch Gatorade in the beer, because that’s how spot-on it was. I could have easily drank the entire keg. James Howat has had one more year to get things dialed in, and his “lambic-style” 100% spontaneous blend, Oxcart, has benefited from this. A lovely straw golden color, pillowy soft mouthfeel, and a slight tartness made this an easy drinking and delightfully enjoyable beer. The addition of Montmorency cherries added some more tartness and some slight acidity, making this one the preferred version for myself. Either one, however, was a winner. Hold on. Melvin didn’t win anything? They did, but then the write-up would have been, “Melvin Brewing at GABF,” and there was more going on that people would like to read about. They again had one of the top booths for beer, with 2X4, Melvin IPA, Hubert MPA, and Clinic (DIPA, IPA, pale ale, and session ale, respectively) all staying true to that Melvin hoppy beer quality. 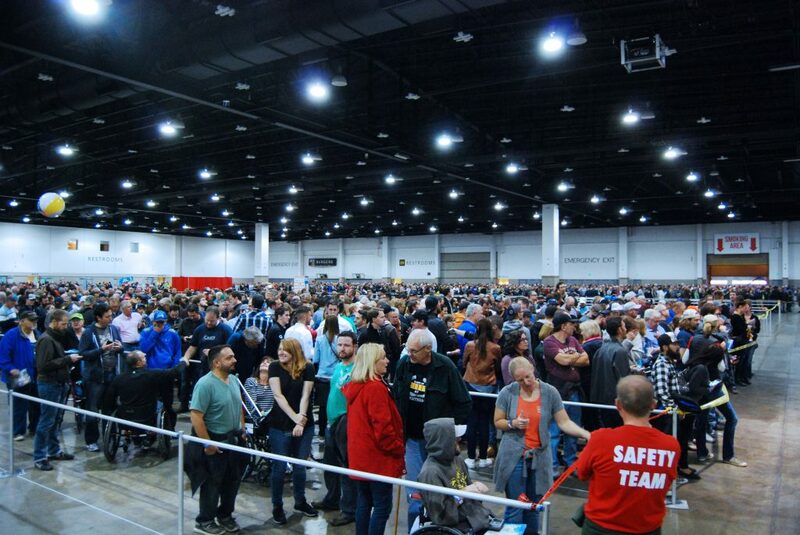 During the Saturday afternoon session they additionally tapped Ch-Ch-Cherry Bomb and Wet Hopped Melvin IPA (which won gold in the wet hop category) whenever the brewers got there (wow – no timed tapping! Finally!). As per usual, I visited their booth the most (for beer, Cypress Grove got it for overall). 2X4 and possibly the Melvin IPA would’ve been in the discussion for top beer of the fest, and we basically stalked them and their bus all week. So why little mention of Melvin, and what does Hall of Fame mean? 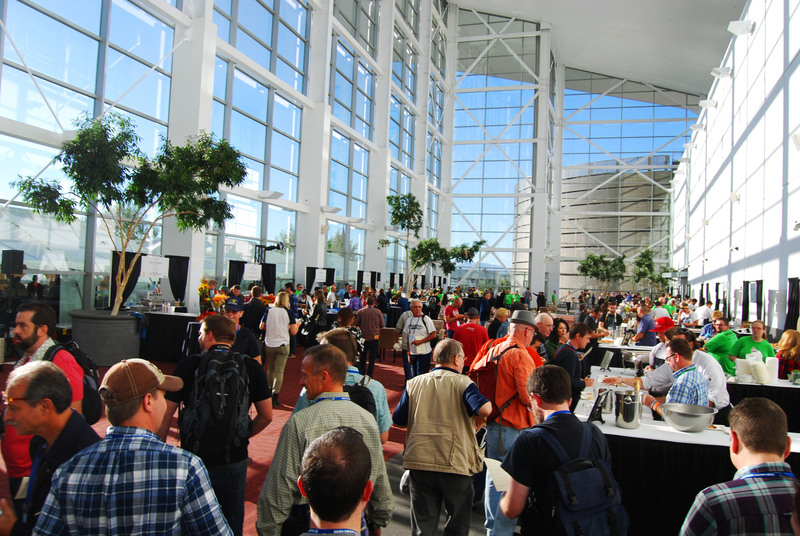 In short, it means whatever brewery is in the GABF Hall of Fame, they will be discussed about simply if they’re at the fest. So instead of having Melvin dominate the categories (which they would’ve), they will always get a mention here if they’re at the fest. They had at least one event every day during the week of the festival, and sometimes two. The Melvin party bus was ubiquitous. All their events had something that wasn’t pouring at GABF, from their smooth and roasty stout (Ruckus) to their Mosaic DIPA (Asterisk) and their Couch Lock DIPA. 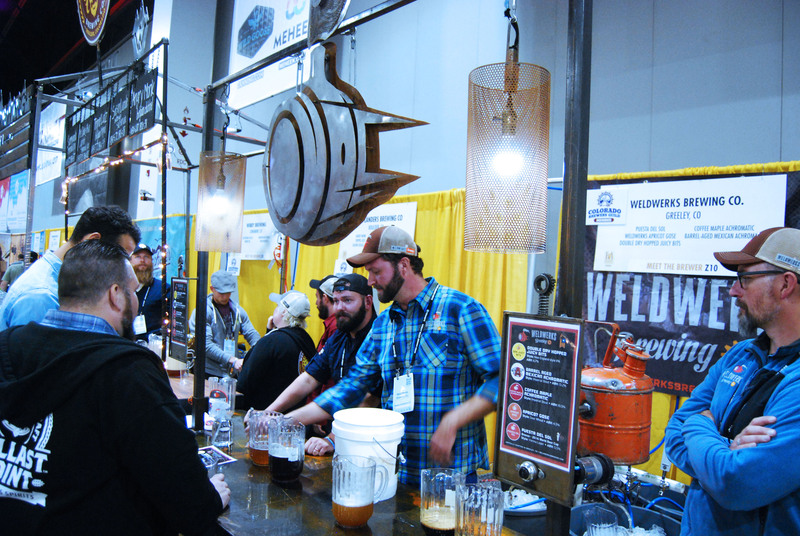 And, more importantly, the Melvin Brewing crew was at each event representing their beer. If Melvin is at a beer event, go. If Melvin beers are on tap at a bar, get there. If there’s Melvin cans at the shop, buy them. Enter the Melvin Chamber.